J & M Remodel recently completed a kitchen renovation in the Belvidere neighborhood of West Seattle. Our customer decided that it was time to update the kitchen into a beautiful place their family would enjoy spending time in, complimented by a stunning Puget Sound view from the kitchen window. The footprint of the kitchen remained the same. Justin suggested that J & M Remodel could extend the peninsula that separated the kitchen work area and the kitchen table. The extended peninsula provides additional cabinetry and counterspace. We also installed a dry bar using custom cabinetry that matches those J & M Remodel installed in the kitchen that ties the whole room together. 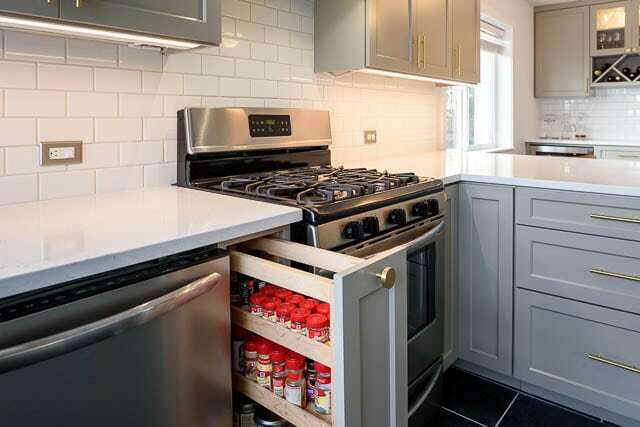 As you view the photos of the kitchen remodel project, you’ll take note of the soft gray custom cabinets with brass hardware that are a key feature of the project. The cabinets are top quality, and include built-in organizers, a wine cabinet, and a glass display cabinet in the dry bar area. The under cabinet lighting that J & M Remodel installed beautifully illuminates the white quartz countertop. The use of white subway tiles throughout the entire kitchen tastefully blends with the striking light fixtures and hardware. Power outlets were installed vertically to flow with the tile layout. The large dark gray floor tiles, with contrasting white grout, flow seamlessly into the adjacent hall which features another brass accented light fixture. 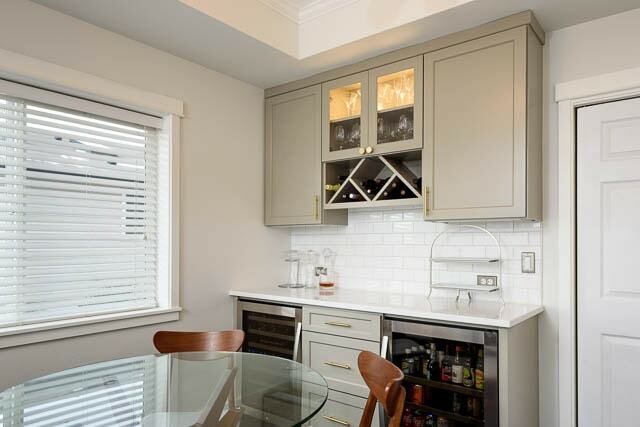 The new kitchen appliances include matching wine and beverage refrigeration. 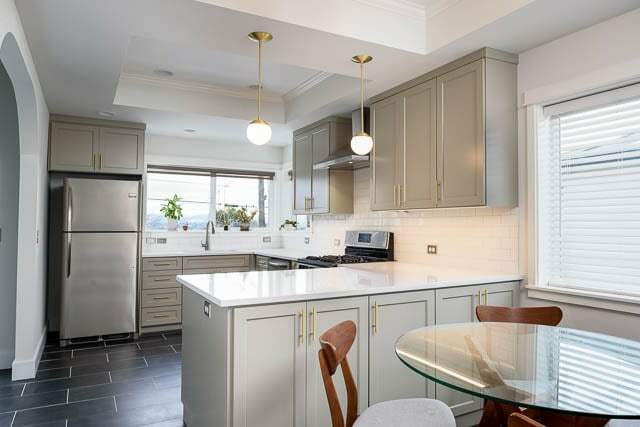 The completed kitchen remodel project is both functional and classically stylish, resulting in a cohesive update that will stand the test of time (and trends) that our delighted clients will enjoy for years to come. Click to view each image in the gallery below in its full size, then use the arrows to advance through the images.